Where exactly does the Middleton's fortune come from? For a couple who own little more than a leg of a modest racehorse (it came sixth at Newbury on Friday) but have ambitions to increase their involvement in the Queen's most passionate hobby, the news is good. Michael and Carole Middleton could be worth in the region of £30m. That is the notional figure City analysts put on the potential value of their Party Pieces empire - but only because it is now inextricably linked to the glittering world of the Royal Family through their daughter Catherine, a future Queen. Without that connection and its lucrative resonance, especially in the US, the company might be worth a quarter of that. How ironic that were it not for Kate, Party Pieces and everything that has flown from it might not have existed at all. For it was when Carole was heavily pregnant with Kate, her first child, in the late summer of 1981, and unable to continue working as a British Airways air hostess, that she started making up children's party bags which she sold to friends and neighbours for pin-money. 'I remember well how it all started,' says Matita Glassborow, 63, a charming retired PA whose wine merchant father and Michael Middleton's father were brothers, and who will be at the Westminster Abbey wedding. 'Carole was very pregnant with Catherine and couldn't possibly continue working as an air hostess in her condition. So while she was at home waiting for the baby she started making goody bags for children's parties among her friends. 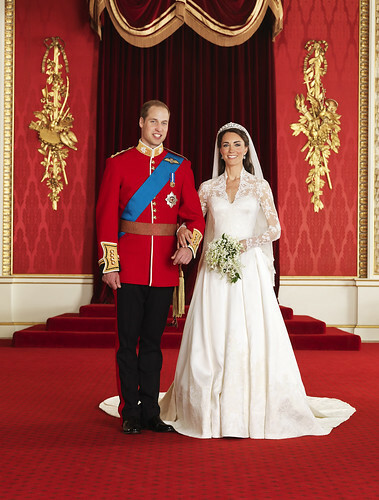 By the year 2000, a year before Kate went up to St Andrews and first met Prince William, the mail order firm was on the internet, employed ten people and was handling more than 1,000 orders a week. Today, thanks largely to an astonishing bounce brought about first by the royal romance and then the engagement announcement, business appears to be booming and Party Pieces employs 30 staff working out of two large converted farmhouses near the family's home in rural Berkshire. When the Daily Mail visited their premises last week a dozen trucks and vans as well as an articulated lorry were being loaded with orders. Meanwhile, Carole Middleton, who spent the first years of her life in a council flat in Southall, Middlesex, has been hunting with Michael for a house that is commensurate with their new status as in-laws to the future King - in-laws who, Prince William has made plain, will not follow the usual royal pattern of being frozen out of the royal circle.